Changes to campaign finance laws mean a larger percentage of Microsoft political contributions now go to Democrats, but the company remains a force in both parties. Steven Weiss was clearly surprised as he looked over a summary of Microsoft's political contributions to Republicans and Democrats for this election cycle. 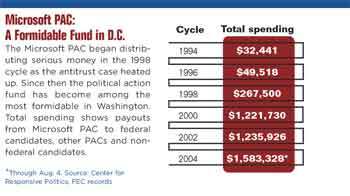 Weiss is a spokesman for the Center for Responsive Politics (CRP), which maintains a searchable database of Federal Election Commission (FEC) records of political donors and recipients at its Web site, www.opensecrets.org. 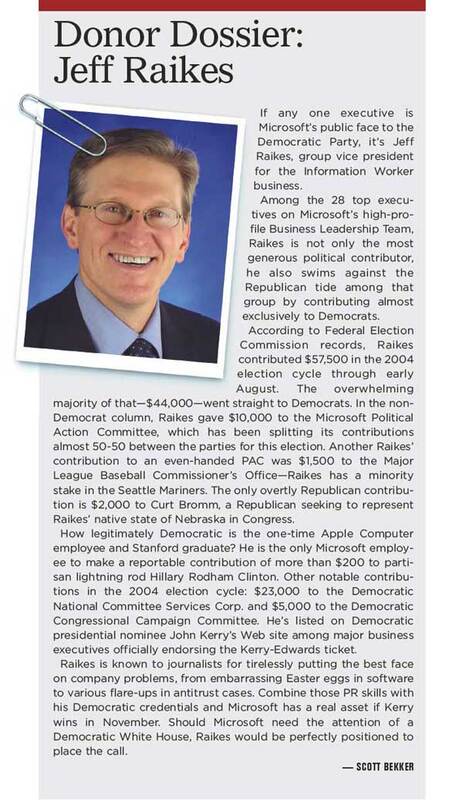 He was reviewing a report on his group's site that rolled up contributions from individual Microsoft employees, the Microsoft Political Action Committee and soft money over the last eight election cycles. "Look at that! That's interesting," he mused. 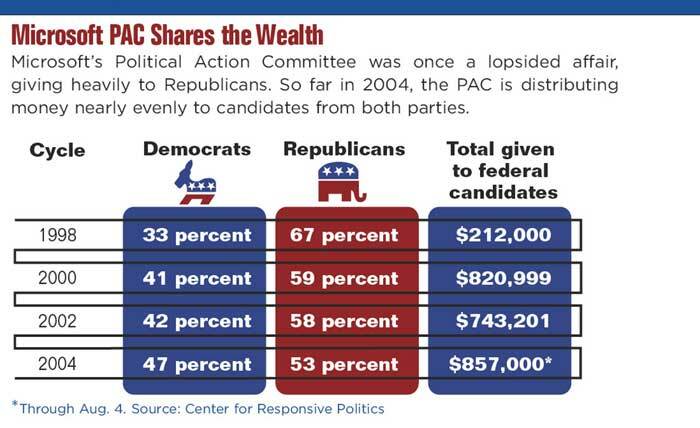 In the 2004 election cycle the formerly Republican-leaning company's political contributions have undergone a massive shift to favor Democrats. When the Department of Justice antitrust case during the Clinton administration became a major threat to Microsoft's future, Microsoft's political giving ballooned and became reliably Republican. 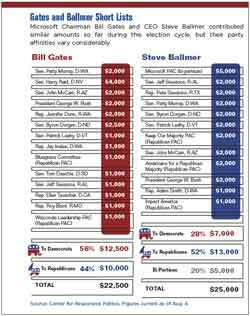 The 1998 election cycle saw Microsoft's federal contributions to Republicans outpacing Democrats 64 percent to 36 percent. The Republican share dipped to 53 percent in 2000 but ballooned back up to 60 percent in 2002. For the 2004 election cycle, at least through late August, the figures are reversed. Democrats got 61 percent of all forms of Microsoft political contributions and Republicans got 39 percent. Has Microsoft had a change of political heart? It appears so, especially at the individual employee level. 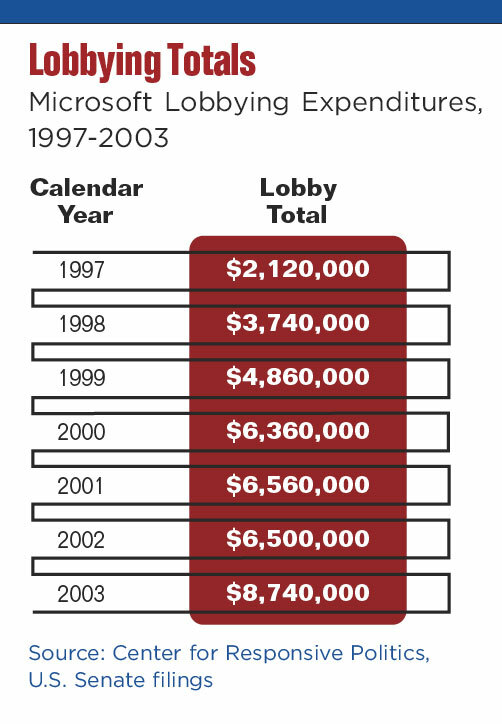 Every contribution comes down to the company's interest and a candidate's positions, but three issues are coming into play in 2004: soft money, political action committees and employee contributions. The McCain-Feingold campaign finance legislation ended the soft money loophole, which allowed unlimited contributions to political parties. Critics charged soft money let companies get around the law that prohibits them from giving directly to candidates. Microsoft used soft money to pour more than $2.7 million into the political process in the 2002 election cycle. That money went to the Republican column at better than a two-to-one ratio. Microsoft does not appear to have diverted that spending into the issue-oriented 527 groups such as MoveOn.org and Swift Boat Veterans for Truth that are partly taking the place of soft money. *Total of reported contributions from Microsoft employees and the Microsoft Political Action Committee in the 2004 election cycle. The company is, however, picking up some of the soft money slack through the Microsoft Political Action Committee (PAC), a semi-official arm of Microsoft public policy. 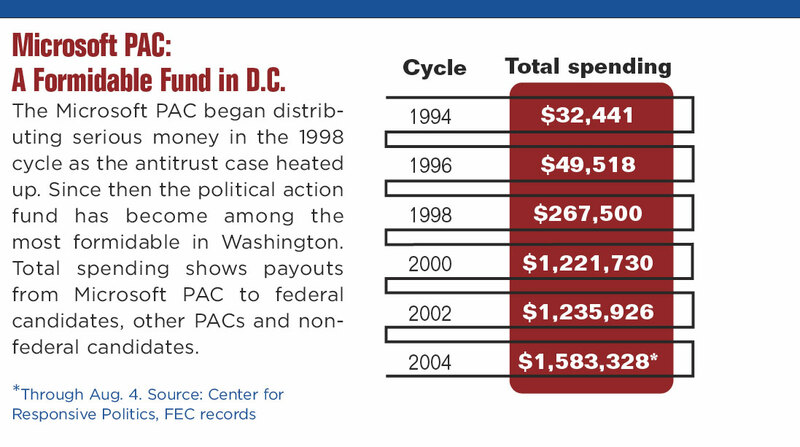 By mid-August, the Microsoft PAC had given a total of $1.58 million to federal candidates, parties and other PACs, up from its own high of $1.23 million for the entire 2002 election cycle. 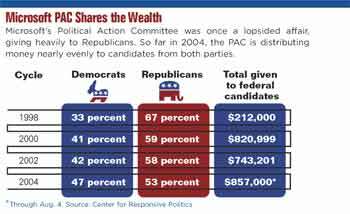 Despite adding a former Bush White House aide, Edward Ingle, as treasurer in 2003, the PAC has swung more money toward Democratic candidates although it still leans Republican overall. As of Aug. 4, contributions to federal candidates favored Republicans by 53 percent to 47 percent. In 2002 the PAC favored Republicans 58 percent to 42 percent and in 1998 it favored Republicans by a whopping 67 percent to 33 percent. As a group, Microsoft employees overwhelmingly favor Democrats—73 percent of their contributions have gone to Democrats, up from about 55 percent in the 2000 election cycle, when employees gave a collective $1.45 million. Through July 5 of this year, employees contributed $442,635 to Democratic nominee John Kerry, the Democratic National Committee and other Democratic presidential candidates versus $187,135 to President George W. Bush and the Republican National Committee. Rationales for the employee change of heart could range from the fact the protracted DOJ battle waged by the Clinton administration is a thing of the past to widespread disagreement with the war in Iraq—and everything else that separates Democrats and Republicans. Bill Gates, at least, seems to have no fear of Democrats. Of the $22,500 in political contributions he made, more than half went to Democrats. Steve Ballmer, on the other hand, favored Republicans by nearly a 2-to-1 ratio. They agreed on one thing: each gave a personal contribution of $2,000 to Bush and nothing to Kerry (see "Gates and Ballmer Short Lists"). It's worth noting that the Microsoft PAC built itself from almost nothing to among the most formidable in Washington in just eight years. 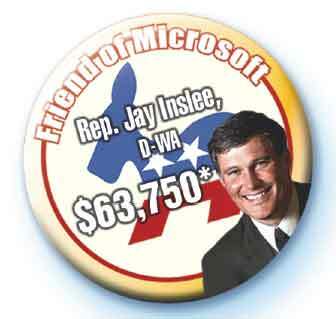 In 1996, Microsoft gave $43,500 to federal candidates. In the 2004 cycle, as of late August Microsoft had given $857,000. That amount ranks it 42nd among all of the several thousand PACs in contributions to federal candidates, according to CRP. No other company in the computer/Internet sector is even close to matching Microsoft's largesse, according to the group. Siebel Systems is second at $277,500 and Intel third at $188,364. Microsoft does have avenues of influence other than political contributions. Any savings Microsoft could have gotten from its reduced soft money expenditures have been offset by Microsoft's lobbying budget. 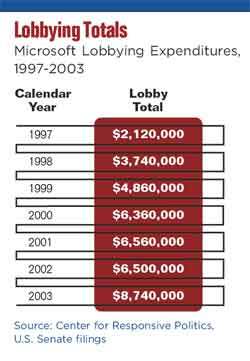 After spending about $6.5 million each year on lobbying in 2001 and 2002, according to records filed with the U.S. Senate, Microsoft cranked up its spending to $8.7 million in 2003—a 34 percent jump. "There was some difficult work being done in 2003 around specific technology issues like spam," says Ginny Terzano, a spokeswoman in Microsoft's Washington office and a former Clinton White House staffer. "We put a lot of resources in terms of making sure that we were most helpful to key legislators on legislation like the spam bill." Microsoft's lobbying filings with the Senate show some of the other issues about which the company approached the White House, Congress and numerous federal agencies. Many of the contacts involved influencing government procurement in the software industry, sort of a government sales call. Company lobbyists also approached the government repeatedly about visa regulations for foreign workers, tax issues and rules governing the WiFi spectrum. Government records on a company's public affairs spending are like getting a glimpse of a few of an octopus' tentacles sticking out of a cave. Outside observers say Microsoft is sophisticated at other types of influence that do not require reporting, such as sponsoring policy forums, contributing to key political figures' pet charities, supporting like-minded think tanks and attempting to ignite grassroots support through efforts like the Microsoft Freedom to Innovate Network Web site. Terzano notes that Microsoft donated nearly $1 million in software and technical support services to both the Democratic and Republican conventions this year. Terzano says Microsoft's aim is to support candidates whose interests align with those of Microsoft and the IT industry. "We're contributing to the overall political process, which is a good thing," Terzano says. "What the Microsoft PAC has traditionally done is given to incumbent candidates who have been helpful to the company or the sector overall," citing trade and spyware as examples. The company supports candidates, "who have taken a genuine interest in these hard, complex technology issues that are often emerging." Critics of Microsoft say the company's spending in Washington supports one main purpose—maintaining the Windows monopoly that the Bush Administration's DOJ declined to break up. "A PAC of just $1 million or $2 million is considered huge in Washington," says Ed Black, president and CEO of the Computer and Communications Industry Association. "That's a pittance for Microsoft to protect its monopoly." Microsoft certainly got a big assist from some of its friends on the Hill in March when the European Commission (EC) ordered a record $613 million fine against Microsoft for European antitrust violations. As soon as Microsoft CEO Steve Ballmer reacted by bashing the Europeans' decision, a chorus of U.S. representatives and U.S. senators took up Microsoft's standard. On a Web page, Microsoft's Freedom to Innovate Network collected quotes from 33 members of the U.S. House and Senate, all supporting Microsoft's position against the EC fine. 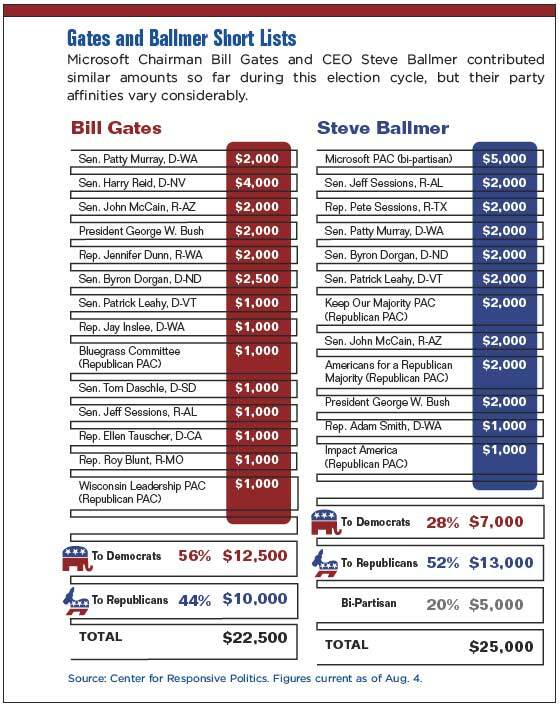 A comparison of those quotes against Microsoft PAC contributions for the last three election cycles shows that 31 of those elected representatives got money—between $1,000 and $30,000—from the Microsoft PAC. Quin Monson, an assistant professor of political science at Brigham Young University, says the Freedom to Innovate example leaves open the question of cause. "You can show the correlation. Is it the fact that they made the donation and then made the statements? Or have they cultivated a friendship because the senator was already predisposed toward Microsoft's positions?" Donors are motivated either by ideology or the desire to gain access to politicians, Monson says. "You can pretty clearly classify Microsoft as an access-type donor. What they're really getting for their money is access to politicians. All they really want is to be able to make their case. You get listened to when you're part of the donor list." *Based on data released electronically by the Federal Election Commission on August 5, 2004. The non-profit Center for Responsive Politics is set up to allow free searches of federal political contributions by donor and by recipient. The center also maintains extensive resources about election law and hundreds of pre-sorted reports. Want to see for yourself what Microsoft, or any other lobbying group's priorities are in Washington? The U.S. Senate maintains its legally required lobbying reports here. Microsoft's official page for public policy information is the Microsoft Freedom to Innovate Network. The settlement in the United States v. Microsoft antitrust case was open to public comments. One of the filed comment documents focuses on Microsoft's efforts to influence public opinion (through political contributions, advertising and other means) during the antitrust case. Investigative reporter Edward Roeder was hired to prepare the heavily footnoted document for the Computer & Communications Industry Association, a tech industry group that frequently criticizes Microsoft.